Conference and public Salon - REGISTER NOW! The Inaugural conference program and public Salon are shaping up. Early bird registration has been extended to October 6 so that you can take advantage of our reduced registration rates. Register now as spaces are limited! With a vision to stimulate national dialogue around critical issues, and provide an opportunity for people to develop a strategy for collective action, the Australian Fulbright Alumni Association (AFAA) will host its inaugural conference Fulbright Alumni: Leadership in a new era on Saturday 18 November at the University of Melbourne. The conference will be launched with a free public Salon on the evening of Friday 17 November, Challenges for Liveability in Australia's cities: Have we reached a tipping point? with Keynote Speaker Professor Billie Giles-Corti. The AFAA chose the conference theme and Salon topic in their conviction that we have entered a challenging new era, in which old ways of seeing and acting no longer apply; and that leadership is needed, more than ever, in critical areas of our society. The question posed by both events is: how can we help strengthen economic, cultural, environmental, and social sustainability for this new global age by providing leadership to form a new agenda? The program features talks from 20 Fulbright alumni from a diverse range of backgrounds. The keynote and panellist sessions are designed to inspire attendees to take on leadership roles in this new era across all aspects of building a sustainable society. Prof Bob Carr’s keynote, “Leading change in a new era: Challenges and Opportunities” and the panel session “What are the greatest gaps in leadership today and how do we fill them” promise to inspire action! Details of the panellists are available here. We are honoured to host Professor the Hon Bob Carr as the keynote for our inaugural conference, November 18th. Remember to submit your abstract if you want to present and register to attend. 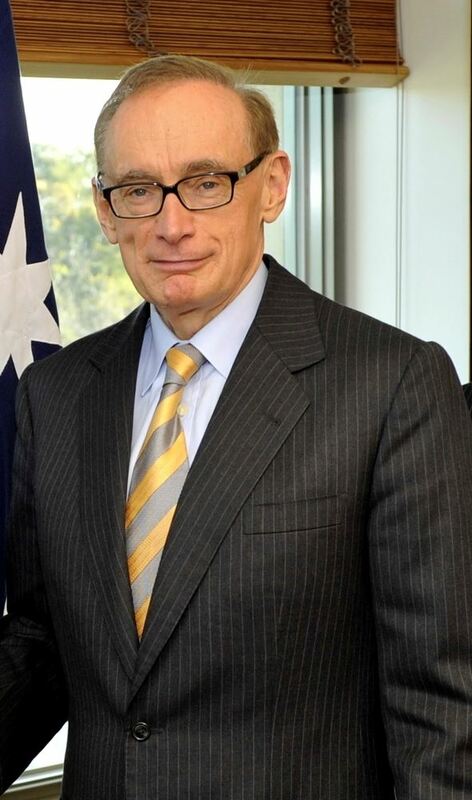 Former Foreign Minister Bob Carr is the longest continuously serving Premier in New South Wales history. He served as Minister for Planning and Environment 1984 to 1988 and as Leader of the Opposition from 1988 until his election as Premier in March 1995. He was re-elected in 1999 and 2003 securing an historic third four-year term. He retired from state politics in 2005. Bob Carr serves on the Board of Melbourne University Press; is a Director of The Lysicrates Foundation and a Committee Member of the UNSW Matraville Education Program Advisory Council. The holiday season is fast approaching and many of us are making plans to host Fulbright alumni gatherings such as annual dinners, welcomes and farewells to Scholars who have joined us for the year, Thanksgiving feasts, and end of year celebrations. As you plan these events, remember the Commission has a great program to support these types of alumni gatherings: Fulbright Alumni Engagement Program (FAEP, https://www.fulbright.com.au/apply-for-an-alumni-grant/). Apply now as applications will close in September. Need help with the application? Looking for fellow alumni to join your application? AFAA can support your efforts. Contact us at admin@fulbrightalumni.org.au. Through the FAEP small grants are available to support activities aimed at engaging scholars and alumni with the Fulbright Program and with each other. The grantees are teams of at least three Fulbright alumni residing in Australia. Applications are received on an ongoing basis throughout the year. · Creating initiatives to find “lost alumni” and reconnect them with the Commission and other Fulbrighters. We are excited to announce that our inaugural Conference will be opened Friday November 17th at 6pm with a Salon event hosted by the Victorian Chapter of AFAA and supported by University of Melbourne. This year's Salon theme is Challenges for Liveability in Australia's cities: Have we reached a tipping point?. The Salon will feature two leading experts in designing liveable and sustainable communities: Prof Billie Giles-Corti and Dr Iain Butterworth. For the full details of our Salon please visit the conference page and make sure to register for both the Salon and full Conference! Dr Iain Butterworth is trained in community psychology with a strong interest in the interrelationship between urban design, planning, governance and well-being. Iain is currently National President of the Australian Fulbright Alumni Association, and an honorary Associate Professor at the School of Population and Global Health, University of Melbourne. Since 2010, Iain has worked with the Victorian Department of Health and Human Services and is currently the Manager of Population Health and Planning for East Division Health. Here, Iain is helping to implement the Victorian Labor Government's policy commitment to fostering “Liveable, Inclusive and Sustainable Communities”. AFAA is excited to be hosting our inaugural conference November 17-18th at the Woodward Conference Centre in Melbourne. The event is shaping up to be an exciting one. The theme of our inaugural conference is Fulbright Alumni: Leadership in a new era. We have entered a challenging new era, in which old ways of seeing and acting no longer seem to apply. Leadership is needed, more than ever, on a number of fronts. The question is: how can we help strengthen economic prosperity, cultural vibrancy, environmental responsibility, and social justice for this new global age by providing leadership to form a new agenda? We are seeking exciting contributions to the program. Please submit your abstract today! 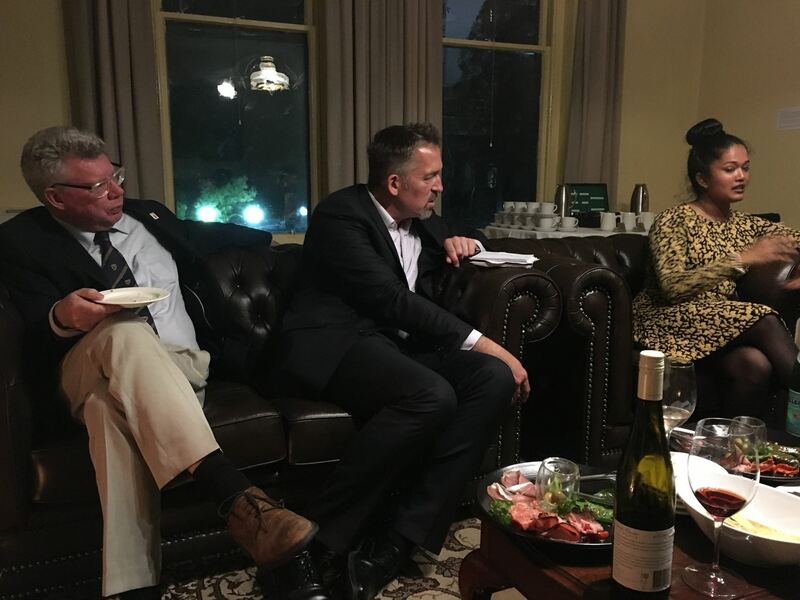 The Victorian Chapter of the AFAA held an enjoyable group get-together Thursday June 15th in the Leather Room, Melbourne University House. Melbourne University Vice Chancellor’s office has generously made this room available for quarterly AFAA meetings throughout 2017. 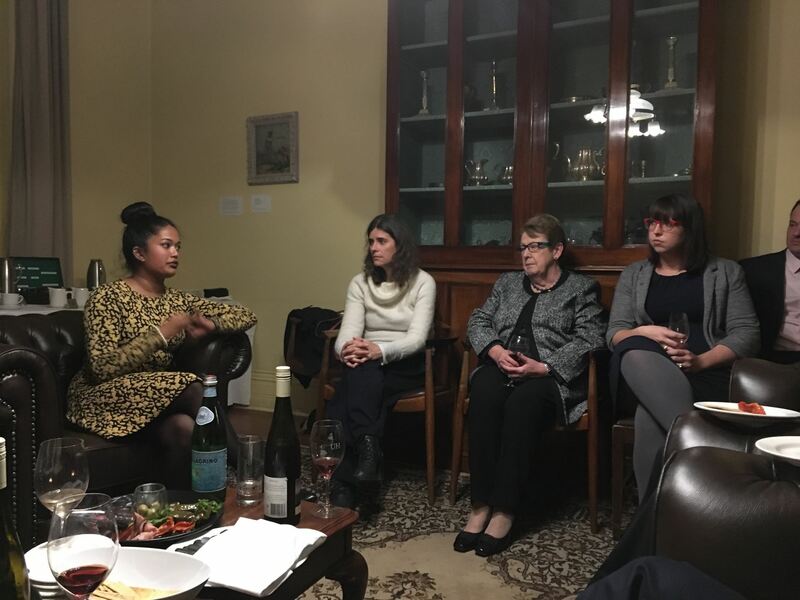 The meeting, held around the fireside, was attended by two US scholars, Shruti Gujaran and Raechel French and Fulbright alumni across various disciplines, including law, education, music, public health, gerontology and community engagement. The active participation by the Acting Consul General, Mr. Ron Lay and Cultural Affairs Officer, Ms. Kelli Long of the US Consulate was greatly appreciated. 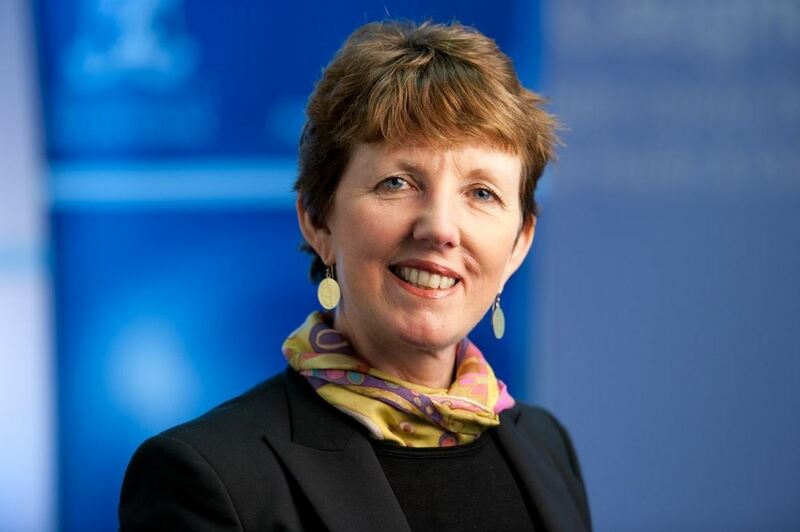 In the first part of the meeting Dr Elizabeth Brooke (Victorian Chapter President), reiterated values contained the higher education conference keynote address by Ambassador (ret.) Jeff Bleich (march 3rd 2017). This speech contains a profound and comprehensive analysis of recent US political events and proposes an inspirational platform for future action. It emphasizes the role of universities and importance of certainty, analysis and education in dealing with political and social futures. Dr Iain Butterworth, National AFAA president outlined recent AFAA developments and future plans for a national conference in November (watch the website for the launch of this event shortly). In the second part of the meeting, the presentations of the US scholars combined science and humanitarian concerns which absolutely validate the intent of the Fulbright Scholarships. The US scholars showed the potential in their projects of expanding to cross-cultural domains applied in different communities. The discussion revealed crossovers between their interests and those of participants, notably in education, public health and building liveable and safe communities. Shruti Gujuran’s project, based at the University of Melbourne focused on antibiotic resistance in hospital-acquired infections under the direction of Professor Richard Strugnell. She reported that her visit exceeded her expectations and she has expanded the application of her project to include indigenous, refugee and local volunteer projects concerning health care and educational disparities. Shrutri has completed her Fulbright scholarship and is currently returning to the US. Raechel French’s research as an educational space planner is focused on designing school environments. Her architecture background has been fused with human-environment relations focusing on facility planning and management. In her work she aligns a school's pedagogy, its organisational structures and its spatial design. While in Australia, she is working on an ongoing ARC Linkage Project, Innovative Learning Environments and Teacher Change. Raechel is at the midpoint of her Fulbright Scholarship. Have you browsed our Events Calendar? We post all AFAA hosted events to this calendar, but we would love for it to be a resource for the broader Fulbright community. If you have a relevant event that you would like to advertise to fellow Fulbright alumni, send the event details to us (admin@fulbrightalumni.org.au) and we will post it to our calendar. Make sure to watch the Calendar for upcoming events and login to your member profile and ensure your group memberships (for local chapters) are up to date. We always email chapter groups to notify members of relevant local events. The Fulbright Commission has launched their Fulbright Alumni Engagement Program (FAEP, https://www.fulbright.com.au/apply-for-an-alumni-grant/). We encourage our members, as active members of the Fulbright Alumni community, to apply for these grants when hosting local events. The application process is simple and will provide an excellent resource for our members to connect with one another and the wider alumni community.